A new report by ACORN Canada calls on the city of Toronto to change how it defines affordable housing so low-income people can afford to live in the city. The city of Toronto to change how it defines affordable housing so low-income people can afford to live in the city, says a new report from the anti-poverty group ACORN Canada. Right now, the city defines it as at or below the average market rent (AMR). "We are in a disaster; we are living a crisis," said Alejandra Ruiz Vargas, a member of ACORN Canada. "The crisis is there but ... nobody can tackle it." The Acorn study finds that from 2014-2017, around 40,000 new rental units were built, but only one in 40 were affordable housing. Just one in 400 new ownership units, meanwhile, were considered affordable. It also finds that from 2005-2015, rent prices increased by 20 per cent, while median household income increased by five per cent. 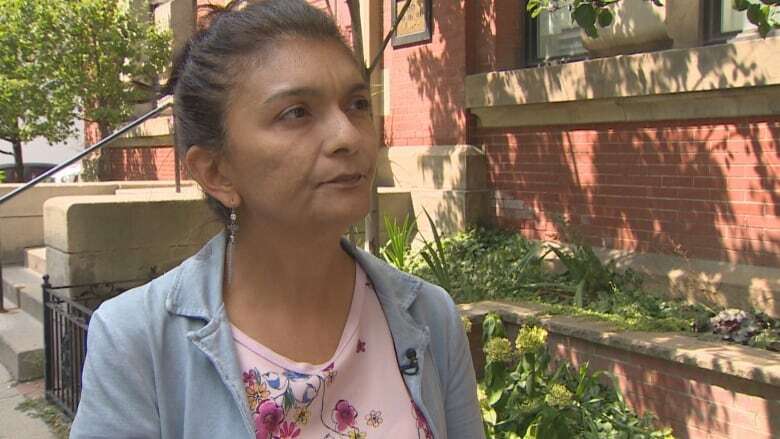 Ruiz Vargas says she knows of families of four or five people living in a one-bedroom apartment who can't afford to move anywhere else because rents have jumped. Mari-Anne Spagnola, 63, has a heart condition and gets close to $1,200 from her disability cheque. But her bachelor suite costs almost $900 a month, which means she's had to make some risky choices to get by. "I would miss doctor's appointments, take half my pills, things like that, because I couldn't afford it," she told CBC Toronto. Because of many stories like Spagnola's, ACORN Canada is calling on the city to change its definition of affordable rent to 30 per cent of one's income before taxes — a definition already used by the federal and provincial governments. The group wants the mayor and city council to increase the city's supply of what it calls "deeply affordable units" and also ensure the affordable housing definition serves low and moderate income tenants. The director of the city's Affordable Housing Office is aware there's a problem and calls it "severe." "A lot of people are kind of feeling stuck within the housing system and that's not a good thing," said Sean Gadon. "They should have more choice; they should have more opportunity,"
But he says the city has added more affordable housing, mentioning the Open Door Initiative. He says the initiative encourages developers to create new affordable housing, resulting in the addition of about 3,300 units over the past three years. But those units are only "affordable" under the city's current definition, which ACORN Canada is pushing to change. Gadon says the city doesn't have enough revenue to pay for programs that would provide lower, subsidized rents, something more than 90,000 households currently receive, but the waiting list is so long, it's left about 200,000 without affordable housing. He hopes the upcoming federal housing strategy and possible initiatives from the new Ontario government will bring more possibilities. Kenn Hale, legal director of the Advocacy Centre for Tenants Ontario, agrees the city needs to change its policies. "The people on the waiting list are the people we should be building housing for," Hale said. "If the people most in need can't afford what you're building with the public subsidies, then something is wrong."